I’ve been home for a few days now and so I decided it’s time to look back at my previous two tournaments. The British started somewhat disappointingly when I got bogged down with too many draws. After winning round one, I had a repeat of my final round pairing from the previous year’s tournament with Black against Dave Ledger. I repeated the Chinese Dragon but his preparation was better this time and the game resulted in a quick perpetual. Looking back at the tournament round three was the most disappointing. Charlie Storey declined to test his Sniper and played the Najdorf. The opening went pretty well for me but he fought quite well. However by the time control I reached what should have been a trivially winning endgame but I played horribly and allowed him to escape with a draw. Another draw in round four Black against the solid Alex Longson and already I was slipping behind in the race. At least I had a pleasant quick win in round five against Don Mason when I move-ordered him into a Classical Taimanov Sicilian. However I dropped another draw in round six with Black against the well-prepared and solid IM Simon Knott and actually I was in a lot of trouble in the final position but Knott was short on time and so allowed a three-fold repetition. So the first week had ended and by the rest day I was on 4/6. 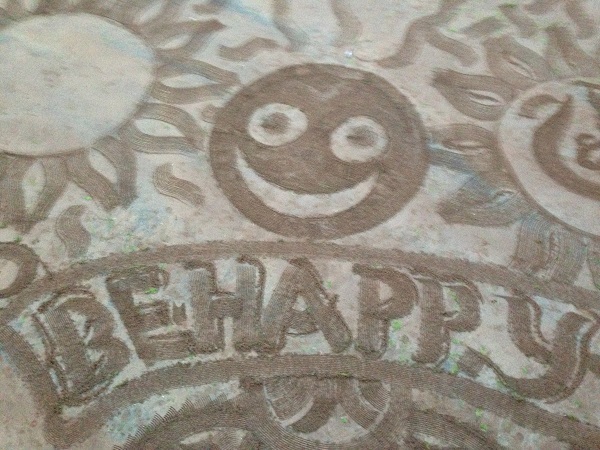 A nice message on Torquay’s beach. The second week started much better with two quick wins over Terry Chapman and Dominic Mackle and I was 3rd=, a point behind David Howell and half a point behind Mark Hebden. Round nine I had White against Ameet Ghasi. Ameet is about the same age as me and was very strong when younger but gave up when he was a strong FM. 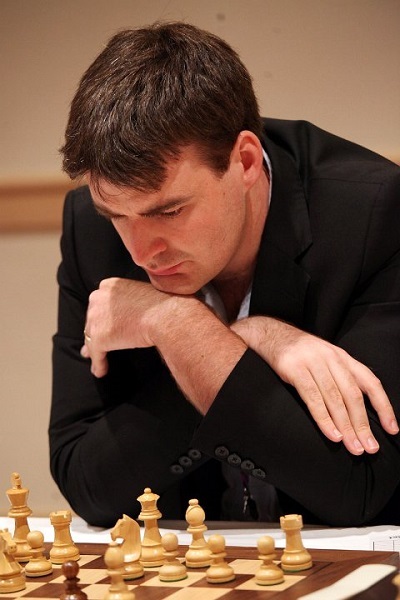 However he came back into chess a couple years ago and is now a strong IM and likely to get the GM title recently if he continues playing. My opening went a bit wrong and I was a little worse with White but I managed some initiative but missed one chance at the time control. After move 40 I really should have forced the draw but instead over-pressed rather and was quite fortunate that Ameet accepted my draw offer. Round ten and we had the pairing we feared as I played my second Richard Palliser. We were sharing an apartment for the duration of the tournament and decided to simply play Crazy Golf as preparation. We knew that a draw wasn’t really any good for either of us and so went for it and actually I played quite a good game to climb to 7.5/10. 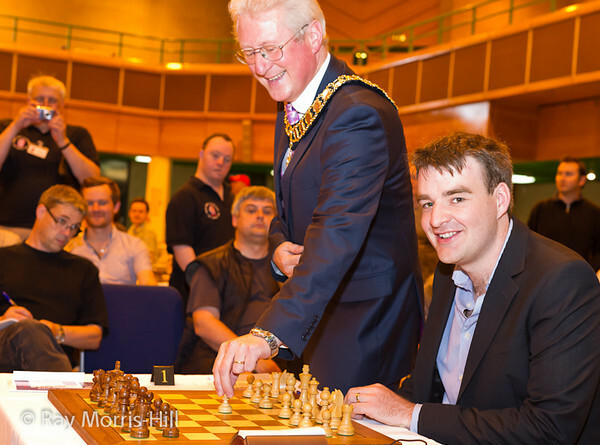 In the final round I was paired with my first GM of the tournament, David Howell. David had a very good tournament and had run away with the title, already on 9/10. As I couldn’t catch him and had an overnight train to catch on my way to the World Cup I offered him a quick draw. He declined, however, but the game ended as a draw anyway. Therefore David won the tournament with 9.5/11 with Mark, Stephen Gordon and me second equal on 8. You can see final standings here. I think I found the first half of the tournament slightly tricky to play with the World Cup overshadowing it but the difference between a good tournament and a bad one is so small; had I converted in round three I think everything would have been fine. Anyhow I didn’t have any time to linger over the tournament as Friday evening I jumped on the sleeper train from Torquay to Reading and on to Gatwick airport for the 8.15am flight to Tromso. The area around Tromso was very pretty with lakes and mountains. It is also going to be the venue for next year’s Olympiad which will take place inside the city. Unfortunately, however, the World Cup was at an airport hotel a fair distance from the centre and so I never got the chance to see Tromso. It was my first time qualifying for the World Cup and it was a great experience. Unusually for a chess tournament, the World Cup is a knockout and so you don’t know how long you’ll be there. I was paired with the young Russian Aleksandr Shimanov in the first round. 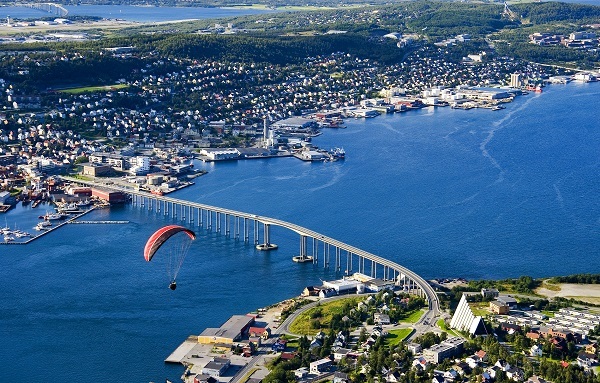 The Beautiful City of Tromso. At the Opening Ceremony Levon Aronian picked the White piece out of Chief Arbiter Ignatius Leong’s pocket (some symbolism there?) which meant I had Black in the first game. I played the Benoni and we went down the fashionable Modern Mainline. I almost equalised but he kept up the pressure and I erred dropping a pawn but managed to fight to hold the draw. Round two with White was a French Tarrasch with 3…c5 where he played an unusual queen retreat. I couldn’t remember the theory and he equalised and offered me a draw. However I decided to try pushing and almost got somewhere but this game ended in a draw too to take the match to rapid tiebreaks. The following day the rapid games started with two games of 25 minutes plus ten seconds a move. Shimanov was White in the first game again and this time I played the Kings Indian. He chose the Samisch Variation and grabbed a pawn. Again it was evident he had out-prepared me as he played a move I hadn’t covered in my notes. I had to give up the exchange to reach an unpleasant endgame but again managed to hold but only after he was pressing for over a hundred moves. Our game delayed the start of the next game and so we only had a ten minute break before we were off again. Another French Tarrasch and again I couldn’t remember my theory and got nowhere in the opening. This time he even declined my draw but offered the draw back and so we were still tied. I returned swiftly to the room before the following round of playoff games. These games were played at the unusual time control of ten minutes each plus ten seconds a move. I struggled slightly to know how to use my time here as it’s somewhere in-between rapid and blitz. This time I had White for the first game and actually succeeded in out-preparing him for the first time and managed a dangerous exchange sacrifice. However I couldn’t find the most accurate continuation at such a swift time control and, although I retained pressure even going a pawn up in the endgame, the game ended in yet another draw. And so onto the final game. This time he switched to the Trompowsky, an opening quite well known in England thanks to the efforts of various top players, especially Julian Hodgson. I sacrificed a pawn for a big centre and the position was probably dynamically balanced. However I was worried he’d be able to consolidate and so pushed through at the wrong time and suddenly all my pawns were dropping off. In the end I had to throw in the towel and Shimanov advanced to the second round to face Kamsky while my tournament was over. Of course I was disappointed at not advancing, especially as the match was so close, but I think I can hold my head up high as in general I defended pretty well and only got knocked out in a lottery game at the end. It’s generally accepted amongst the players that this format is not conducive to good play and you need a lot of luck to advance. I feel I learnt a lot from the experience an am looking forward to trying to qualify for the one in two years time. You can follow all the action with commentary from Lawrence Trent and Susan Polgar for the next few days followed by Nigel Short and Dirk Jan Ten Geuzendam. Even back at home I’m finding the coverage very addictive!